These feathers have been bleached to remove almost all of the natural pigmentation. The end result is a beautiful light creamy tan color perfect for bouquets, hair clips, jewelry, and other accessories. It creates a very unique look alternative to the classic peacock blue color scheme. Our 10-12" Peacock Eyes have been cut down from longer tail feathers. As a natural product the size of the eyes will vary, but average around 3-4" in total width. 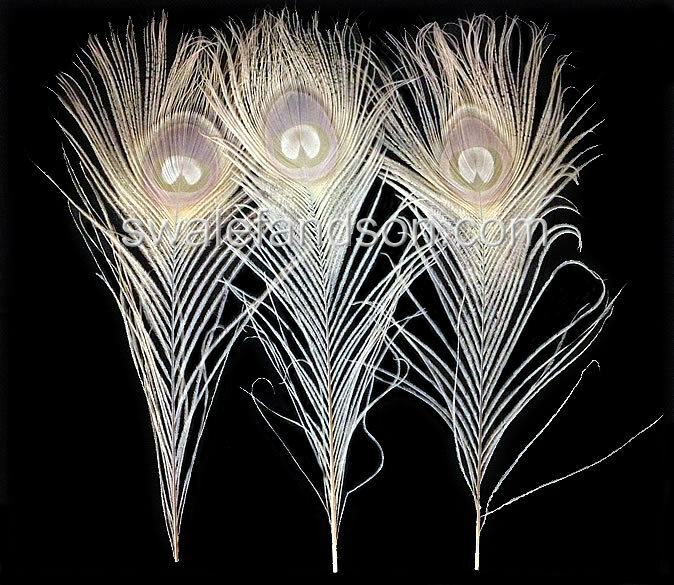 We steam all our Peacock Feathers to be sure they're ready right out of the box. Sold in bundles of 100 feathers.